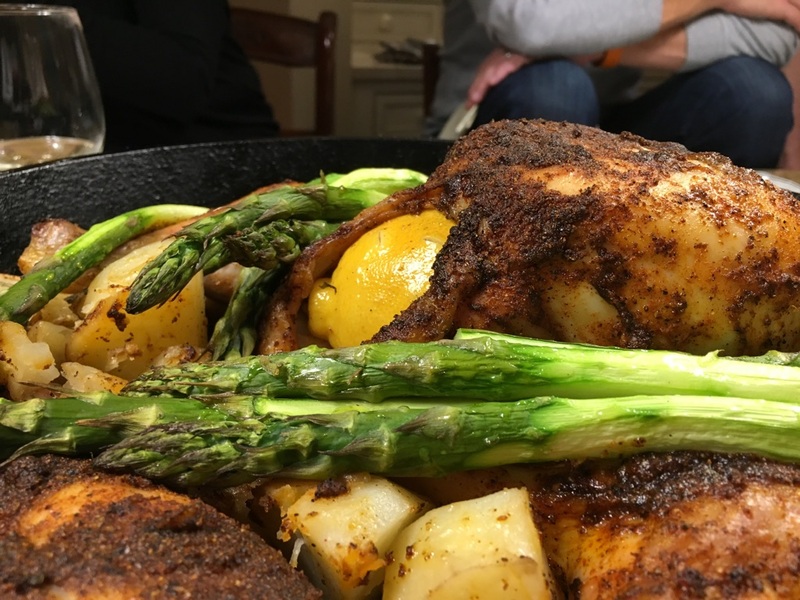 In our house we call this “Robbie’s Chicken”… using up what we have in the fridge and cooking it all in stages in one large skillet on the grill. Lodge is our cast iron of choice and we like to use the 15-inch skillet for this recipe. That way you can pile on all the veggies and give them plenty of room to cook. Combine all the ingredients and stir to mix. Put in a glass jar and store in a cool dry place for up to a year. Cut the skin from the legs away from the breast of your chicken. Season inside and out with Maldon and freshly ground peppercorns. Set aside. Now in a small bowl, add enough olive oil to ½ cup of “My Memphis Dry Rub” and make a “wet rub” paste. Smear rub over the outside of the chicken. Poke a lemon several times with a sharp knife and place it with a spring of rosemary, thyme and or sage inside the cavity of the chicken. Now place the chicken in a large Lodge cast iron pan and set uncovered in the fridge until ready to cook. When ready to cook, remove chicken from fridge and bring it to room temperature. Preheat grill to 450 degrees and place the chicken in the Lodge on the grates over direct heat. Close the lid and cook for 10 minutes. Now move the chicken to indirect heat or turn off the middle burners of the grill. Cook for about an hour + anointing the chicken with a drizzle of EVOO if skin starts to dry. About ½ hour into the cooking, toss the veggies with EVOO and surround the chicken with them. Stir with tongs ever so often. Let chicken rest, covered lightly with foil for 5- 10 minutes. Carve and season with Maldon and freshly ground peppercorns. Serve with the veggies squeezing the juice of the lemon over all to lift. Garnish with fresh herbs.